All I can say is ….I'm glad it's over. Thank God! I knew Baby2 was on board when I couldn’t keep my eyes open pass 7:30pm. On a usual day, I don’t even start thinking about getting ready for bed until 10:00pm, now all of sudden, I’m too tried to even get ready and just leave whatever I was doing and jump right into bed. We were planning for it so I knew this has got be it. Had to wait a couple more days to take the test and of course it came back positive. Just like that, life is about to change again. On cravings, the first half of it, all I wanted was restaurant food and fast food, both the good and the bad. As long as it was not cooked in my kitchen, I’ll take it. Second half was complete opposite. For the better, thank God; because I was starting to scare myself with what I was eating and the rate at which I was eating out. I see how some dads easily get the sympathy belly too now when their wife is pregnant. Every time I want to eat out, "we" eat out. 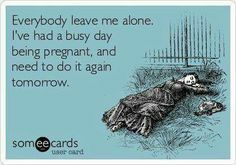 If had continued at that rate, well I could easily see hubby progressing right along in the growing belly business with me. So, for the second half of the first trimester, all I wanted was some good Nigerian, home cooked meal and I kicked off that craving’s satisfaction at my sister’s wedding. Even my sisters eyes got big when she saw my plate and on top of that, I was complaining about how I couldn't taste or eat everything. Well, when we got back home, let’s just say any small energy I had I spent it all on cooking. This was the time I really wished there is a Nigeria restaurant somewhere close to us in NC. So far don't think there's any. Someone needs to fix this. I’ve been cravings a lot of okra soup. We barely eat okra on a regular day just because hubby doesn't eat it and I don't feel like making two kinds of soup every time, although okra is relatively easy to make. Well now I do. I have to eat my swallows with okra now, and maybe mix with vegetable stew or whatever else there is. Fish stew is my next fixing. I've always complained I don’t know where to buy whole fish that's where I don't make it. Now I’ve been lucky enough to find some at my local Walmart and even though I’ve found some store that might sell produce I’m looking for, I’m yet to drive my lazy bum down there to see because it's like 30 minutes away and in my book, that's far. So on rotation for now, as long as I keep hitting the jackpot is fried fish / fish stew and lots of okra. Rice is a given. Give me some good, preferably party jollof, which doesn't happen often but I’ll settle for the ones I make or white rice with fish stew and I’m happy. Morning sickness; this wasn’t even in my vocabulary with Eliana, but with Baby2, I experienced all of it. From the nausea, to the vomiting, to the headache, to the tiredness, to the metallic taste that makes everything taste awful and just feeling completely drained both physically and emotionally. Some days, I don’t even know how I made it through the whole day at work. My ultimate goal was staying awake the whole day and as soon as I enter a room for a meeting, I was looking for the closet trash can and sitting strategically close to it. Thankfully, I didn’t put on a show in front of everyone, although I came close a couple of times. Now in my second trimester, I feel much better and like myself again. Looking forward to enjoying the rest of this pregnancy and maybe resolve this mommy guilt I’m having about not documenting Baby2 pregnancy as much as I did for Eliana. Talk to you soon and have a great weekend! Thanks for sharing. It's always good to start somewhere than never document at all. I felt the exact guilt during this pregnancy but I started a journal n I bet it's better than nothing. You have felt everything I have in both pregnancies and I can't wait to finish the journey. Keep going and I know ur doing a good job mama. Loads of hugs from us here.